Is French toast really French? Does anyone know? I mean, if the French invented this, I think I may need to relocate. I know they are culinary geniuses and all, but da-anggg! French toast R.O.C.K.S! I’ll be adding this to my Saturday morning repertoire with my munchkin man. He loves it too. Here’s how I adapted an old recipe to a clean eating version. Combine your egg whites, milk, cinnamon and vanilla in a bowl. Whisk until well blended. Cook in a non-stick pan without any oil. Keep the heat low to medium low so it doesn’t burn. 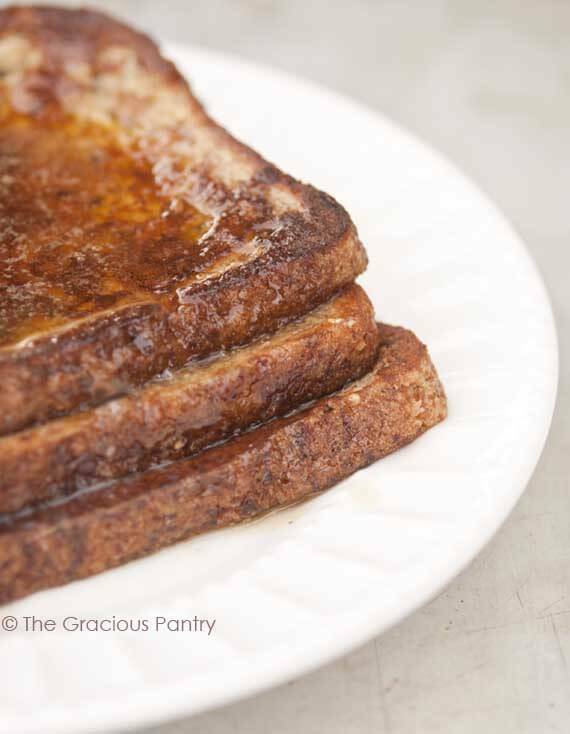 Cook a bit longer than you would regular french toast to be sure the egg gets cooked at the lower temperature. Plate your food and top with your favorite French toast toppings! Please Note: Nutritional Content will not available for this recipe and will vary depending on bread used. OMG, I cant wait for this. You’re very welcome! Let me know how you like it! Chrystal – Glad you enjoyed it! I make this all the time, we change the toppings: strawberries, bananas, fresh nuts, etc. It’s a go-to breakfast for the weekends! Avery – I don’t use the liquid egg whites any longer. I just take out a half cup measuring cup and crack eggs until it’s filled up. The number will depend on the size of your eggs.